Alden Ehrenreich has won one of the most coveted casting positions available – Han Solo. The stand-alone ‘Star Wars‘ spinoff from Disney has made a lot of waves with the buildup as to who would come out on top. We don’t know many details about the Solo film, but we know the film is to cover his earlier days based, in part, by the Star Wars Expanded Universe line of books and novels that have surfaced about the scruffy nerf-herder’s younger days. 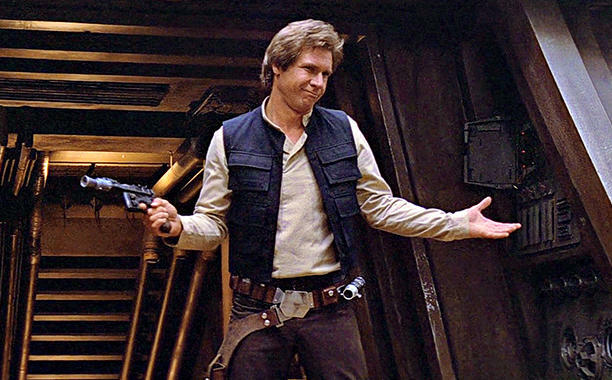 The film will be titled ‘Han Solo: A Star Wars Story‘ and not the hilarious title it’s been called “Project Red Cup”. I’ll wait. Get it yet? Red Cup = Solo Cup? Aha, there ya go. Either way it’s in early pre-production under directors Phil Lord and Christopher Miller. The film is set for release May 25, 2018 from ‘The Lego Movie‘ helmers. Ehrenreich stood out in ‘Hail Caesar!‘ and ‘Beautiful Creatures‘ and is looking at a Howard Hughes project with Warren Beatty. All I can say is he’s going to make a dashing young Solo. This entry was posted on Thursday, May 5th, 2016 at 10:42 pm	and is filed under Books, Comics, Film, News. You can follow any responses to this entry through the RSS 2.0 feed. You can skip to the end and leave a response. Pinging is currently not allowed. « Roger Avery is Back in the Director’s Chair with ‘Unwind’!